The Italian Professionals Netherlands (IPN) group aims at building a strong professional network between Italian people who live or work in The Netherlands, and to connect them to other professional Dutch and non-Dutch groups. The purpose of IPN is to offer its members opportunities to be introduced to, meet and get together with other high level professionals who also want to boost their professional relationships in Holland. To enhance the “virtual” connections between its members, periodically IPN organizes networking events where people can meet face to face, get to know each other better, and share their knowledge with other members. 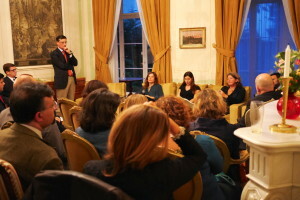 Events are held in English or Italian language, depending on the audience. Note: IPN doesn’t have any commercial purposes, even though business collaboration between its members is what we see and what the group hopes to see growing even more in the future as a direct consequence of the good relationship born and strengthened within the group itself. Founded in 2009 and currently made up of 1600+ members, IPN is constantly growing. Not all its members are Italians: being able to speak the Italian language and having a strong link with the Italian culture is what brings all IPN members together. Every year IPN organizes more formal occasions for its members to come together and discuss the role of the Italian-speaking expats in The Netherlands, and get a better understanding of more practical aspects of living in this country as foreigners (topics such as Dutch pension, healthcare and tax systems, Innovation, Business Systems and methodologies were been covered in the past). Being recognised as a talent attractor, the IPN group has developed a good relationship with the local Italian institutions, in particular with the Italian Embassy in The Hague. The IPN group has had the Ambassador of Italy to The Netherlands, Andrea Perugini, as special guest to many of its events. Also, Mr. Perugini invited us to organise several meetings and events at his residence. Articles about IPN have been published in the Business Haaglanden magazine and the Diplomat Magazine online.